Beautiful Casa del Toro in Manuel Antonio! Private Pool at Casa del Toro! Lights of Quepos at Night! Welcome to Casa del Toro! 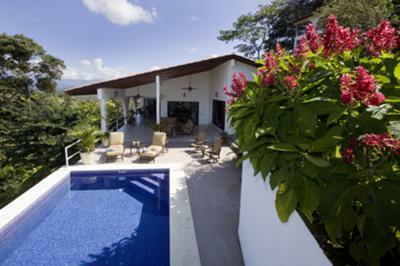 Located on the Central Pacific Coast of fabulous Costa Rica, it’s debut in January 2011 makes Casa del Toro one of the newest vacation rental homes available on the market. Only minutes from the newly built Quepos Marina, home of World Class Sport Fishing, this beautiful holiday rental home is, likewise, just minutes from the internationally reknown Manuel Antonio National Park and Beaches. Designed and built by a local award-winning architect, Casa del Toro’s uniquely tropical “Western” theme pays tribute to it’s owner, Champion Bullrider and Rodeo Promoter, Jerome Robinson. This casually elegant vacation rental house features stunning ocean and rainforest views from all rooms, with impressive cathedral ceilings of precious hardwoods throughout. The 3 spacious bedrooms, 3.5 comfortable bathrooms, large indoor living area, cozy home office space, modern kitchen and indoor dining area, as well as an expansive furnished outdoor living and dining area, are all perfect for making the most of your exotic Costa Rica vacation. Equipped to provide guests with all the comforts of a home away from home, amenities include a full time concierge, maid service, wireless internet, a/c throughout, ceiling fans, flat screen cable televisions in all rooms, DVD player, Stereo with iPod dock, safe box, telephone, security system, washer & dryer, microwave oven, coffee maker, blender, dishwasher, BBQ, and the crown jewel, a fabulous swimming pool perched on the edge of the spacious decking. Marvel at the breathtaking views of the town of Quepos, ample stretches of the Pacific Coastline and miles and miles of deep blue ocean, tropical green rainforest, surrounding farmlands and majestic mountain peaks. 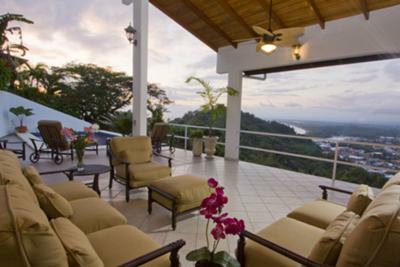 This Manuel Antonio Vacation Rental Home is the ideal location for groups of 6-8 guests looking to enjoy an ample variety of local tours, restaurants, spas, World Class sport fishing, fabulous beaches, or the area’s most popular attraction, fabulous Manuel Antonio National Park. The house manager is available to explain Casa del Toro’s sustainable tourism program, see to all guest’s needs both before and during your visit, as well as assist travelers looking for an easy, affordable, well equipped Costa Rica vacation rental home. 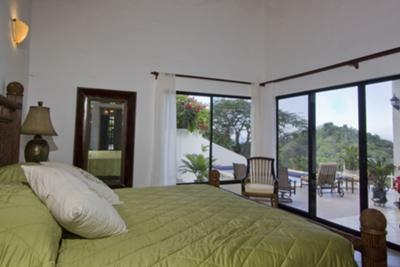 Casa del Toro serves as the perfect central location to make the most of your leisure vacation, family getaway, medical tourism vacation, romantic escape, special event or for those business travelers looking for a different experience than the average hotel in Costa Rica has to offer. Today is the day to turn your dream vacation into a reality! Contact Casa del Toro at info@manuelantoniorentalhomes.com now and let us take care of all the details for you! Ask about our introductory discounts available for selected dates!! An attractive listing with lots of helpful information. Good job, Kimberly! Join in and write your own page! It's easy to do. How? 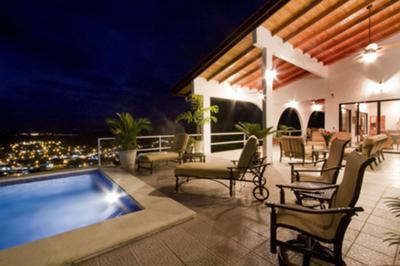 Simply click here to return to Manuel Antonio Vacation Rentals.